Two common conditions can cause stiff, and sometimes painful, shoulders. They are arthritis and a frozen shoulder. Arthritis is inflammation in your joint as a result of wear and tear. The cartilage that lines the ball and socket joint wears thin and your shoulder starts to ache and lose some of its movement. If arthritis is the problem your shoulder will be painful and stiff. You will also find some of your usual daily activities become more difficult because you can't move your shoulder as much as you used to. You will probably have an X-ray of your shoulder to confirm that arthritis is the cause. The best way to limit the pain and stiffness of early arthritis is to keep active and do specific exercises for your shoulder. These include shoulder-assisted flexion and abduction, and the hand behind back exercise. Usually when part of our body is painful we try to avoid moving it, but this isn't good for arthritis in your shoulder. If you stop using it, your arm will become weak, which will just add to your discomfort and frustration. You may also want to see a physiotherapist to get a specific programme of exercises for your shoulder. You may have to pay for this. You will find more information in the arthritis section. Frozen shoulder is the common name for a condition that used to be called adhesive capsulitis. 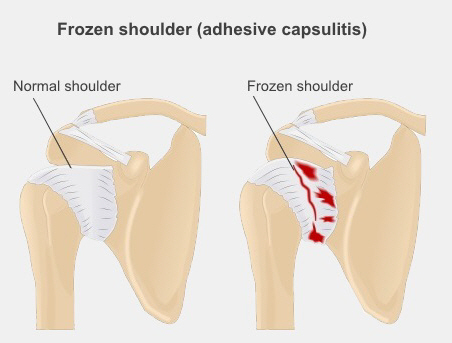 In frozen shoulder, the capsule of thin tissue that covers your shoulder joint becomes thicker and inflamed. This can make it harder to move your shoulder. It's not clear what causes frozen shoulder. It can happen for no obvious reason, or it may happen after a shoulder injury. It most often happens between the ages of 40 and 60, and is more common among people with diabetes. If you have a frozen shoulder you will notice that, over several weeks, you gradually become less able to move it. Moving it will also be painful, especially if you are putting your hand behind your back or reaching forward. The pain may be worse at night. There are usually three stages to frozen shoulder. The first symptom of frozen shoulder is usually pain, and it can last up to nine months. During this phase you should see your GP for pain relief, and possibly a steroid injection to help with the pain in your shoulder. Physiotherapy usually isn't helpful during this phase. During this phase the pain gradually gets better, but your shoulder will still be stiff and have limited movement. This phase can last up to 12 months. During this phase steroid injections can help you with pain. Once the pain has settled physiotherapy may help you to get movement of your shoulder back. The pain has gone, and the stiffness gradually gets better. But it can take up to three years to recover fully. At this stage it's important to see a physiotherapist for exercises that will help you get full movement back, strengthen your upper back and shoulder muscles, and improve your posture. Exercises you can do at home include shoulder-assisted flexion and abduction, and the hand behind back exercise. Written by a Canterbury physiotherapist. Adapted by HealthInfo clinical advisers. Last reviewed September 2017.